I have a secret fear, which I will now confide in you: having conversations with Bob Keelaghan. Bob's brain is bigger than anyone else's, and I can usually only barely keep up with him in conversation. But he's a mean guitar player, and this shows it. 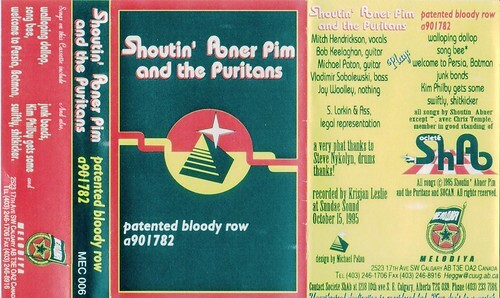 Shoutin' Abner Pim and the Puritans eventually trimmed their name by 75% or so, and ended up as the Puritans. For this release, half-man half-machinedrummer Stephen Nykolyn is in the drummer's seat, and Ex-Boyfriend Michael Paton is on second guitar. Following the collapse of the Puritans, Bob and bassist Vladimir Sobolewski put their energies into the fantastic Agnostic Mountain Gospel Choir. This tape was later released as part of the band's Marquee Themes CD, which you can download on ye olde iTunes.